3 different ventilation speeds, programmable timer and sleep function with automatic switch-off. 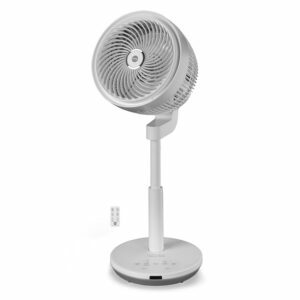 It is possible to block the fan in any inclination in order to direct the air flow in the desired direction. Thanks to the high performance and to the double oscillation, brings down the heat generated by the heating systems, making the environments with living height even more comfortable. 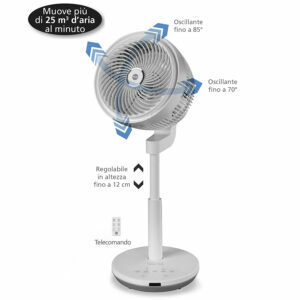 Innovative multifunctional bidirectional fan: can oscillate at an angle of 180° thanks to the splitting of the tower structure that allows to direct the air in two directions. Programmable from the control panel and with remote control. Can be set to three speed. Mode of operation: normal, natural or sleep for the night. Elegant bladeless fan, safe and silent. 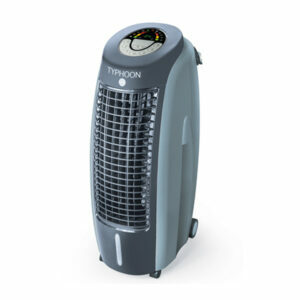 With exclusive Cool Channels™ for a powerful air flow and Fresh Ion™ Technology for a healthier environment. 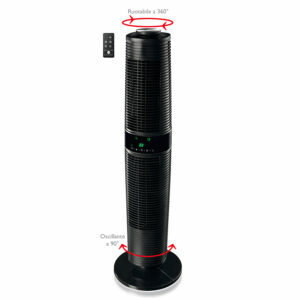 EZtouch Controls™ panel and remote control to select 4 different speeds and to control the oscillation. Timer which can be programmed to up to 8 hours with automatic turn off. Washable and easily extractable filter thanks to the EZclick™ System. 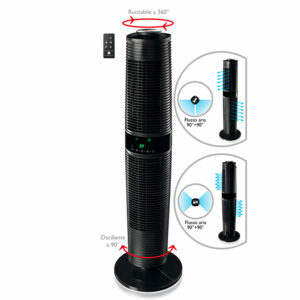 Compact, with oscillating base and convenient remote control holder. 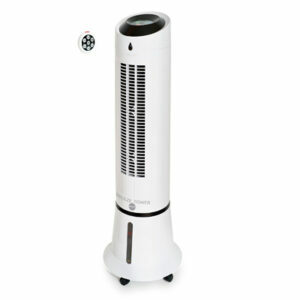 Innovative evaporative air cooler with ionizing functiondelivers fresh clean air in any environment. Thanks to the two included ice boxes, you can augment the cooling power of this powerful air mover. Possible to automatically rotate the diffuser for a multidirectional flow. Soft touch control panel and remote control to select desired functions. 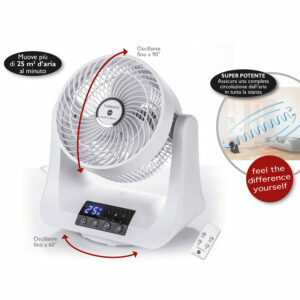 Three fan speeds and three different ventilation programs with variable speeds. Programmable for auto shut off. No output tube required for air conditioning function. Rotating castor wheels allow for easy transport and positioning just about anywhere. 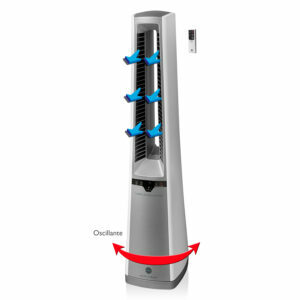 BREEZE TOWER, a multifunction evaporative air cooler with ionizing function in a compact modern design. It's innovative bee hive panel evaporative technology turns warm air to cool air in seconds while the ionizing function purifies the outgoing air. No output tube required, easy to move thanks to incorporated castor wheels. Evaporative water cooler with ionising function to get fresh and clean air in any enviroment. Twin turbo centrifuge fan with air flow up to 4 times more powerful: 1,500 m3/hour. 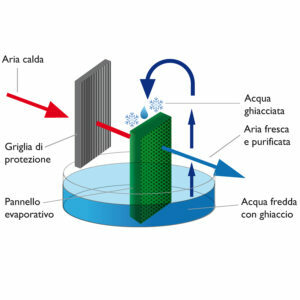 15 litres water tank and two ice boxes are included to increase the cooling effect. Ability to set the diffusers for a multidirectional flow (vertical and/or horizontal). Soft touch panel and remote control to select the desired functions. Three different normal speeds and three different reduced speeds. 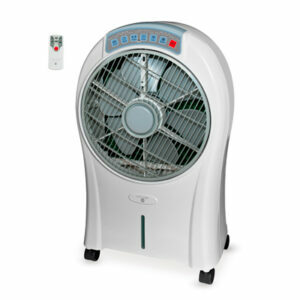 Functions: cooler, ionizer and humidifier. It does not require pipe for cooling operation. Swivelling wheels with locking system, allowing to transport it and to place it anywhere in safe conditions. 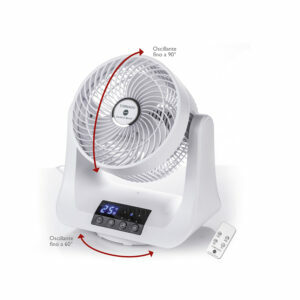 Fan that generates a cloud of water refresjomg. Works by batteries. It can be brought everywhere ovunque: at the beach, pool, car and yard. Its blades are soft and safe. Fresher..for a colorful fresh summer.